Up to five "child" burrless slabs can be cut in a single operation. One operator per shift can produce over 90,000 tons of finished product per month. Environmentally friendly and safer working conditions for the operator. It is impossible to cut a steel slab "off square." Gravity ensures that the slab rests in a parallel position as the torch tracks at 90 degrees. The PLC and computer controls monitor to an accuracy of 1/16 inch on cut pieces. The kerf width has been reduced to only 1/4 inch, significantly improving yield. Energy consumption is reduced. Automatic on/off torch controls eliminate gas and oxygen waste. Productivity monitoring, a vital tool to production management, is built into the system enabling continuous improvement programs to be implemented to the automated steel cutting machine. 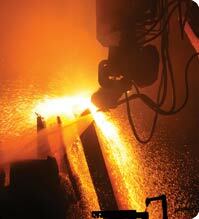 The burrless slab cooler cutting process avoids thermal shock cracks on most grades of steel. No preheating is necessary.